Former police station in Sowerby Bridge. West Yorkshire Police have earned £15m through selling off buildings over the last five years. Since 2014, 23 properties owned by the force have been sold for a total of £15,333,270, according to figures released under the Freedom of Information Act. Former police station in Hebden Bridge. The biggest sale was the force’s training complex in Wakefield, which was flogged for £7.2m last year. Other assets that also raised more than £1m were the Belle Vue garage and support office in Leeds, which earned the force £1.67m in 2014, the driver training school in Wakefield, which raised £1,29m in 2017 and a support office on Wakefield Road in Leeds, which raised £1,74m in 2017. West Yorkshire Police currently owns or rents 68 properties. Many of these comprise of one building, but there are several complexes with several buildings on site and with separate outbuildings. A large number of partner premises are also utilised. Additionally, West Yorkshire Police owns 10 police houses which are all situated within the grounds of existing police stations. Of these, three are used as offices, two for training, two are rented out and three are vacant. Planning permission has been applied for to turn the former Elland police station into a health centre. Patricia Banyard is the owner of the Hebden Bridge Antiques Centre, which is situated in the former Hebden Bridge police station. Patricia said: “The building was put up for auction after it was flooded and was deemed unsuitable for access by emergency vehicles and what have you. “It was built in 1860 as a police station, and I bought it in 2014 and opened my shop there a year ago. “We took out the cells and the police counter. They’d just been using it as offices really. “It’s nice. It’s actually more in-keeping now with how it was originally after our refurbishment. Wakefield’s former police station on Wood Street closed in 2014 amid plans for the council to turn it into a luxury city centre hotel. Little progress has been made since then though, with the site used for morning worship by the city’s cathedral, who took a lease out on the building. The council says local businesses are still keen to take on the property. 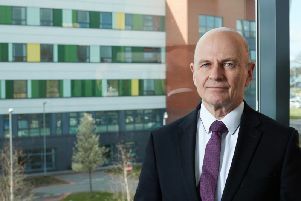 West Yorkshire Police and Crime Commissioner (PCC), Mark Burns-Williamson is responsible for the overall policing budget in West Yorkshire and said: “Since 2010, West Yorkshire Police has experienced Government cuts to the tune of £140m, with the loss of around 2,000 jobs. “Given this sustained austerity, I have explored every possible option with West Yorkshire Police that ensures we retain a strong frontline presence, coupled with premises which are fit for modern day policing. “It led to the development of the West Yorkshire Police Estates Strategy 2015-2020, looking at ways in which savings and efficiencies could be made from our estate, whilst mitigating the impact upon communities. “After assessing the use of our buildings against a back-drop of a reducing workforce, we were able to determine those that offered the best value for money and operational options. “Much of our plans have been about having smaller, newer and more cost effective police premises in a similar location. The newly built state of the art buildings across the Force, for instance, have given us greater capacity and are specifically designed with modern policing facilities in mind. “Whilst the financial returns from the sale of buildings can only be used as investment towards future capital investment, the money saved from their significant running costs has been pumped back into frontline policing. “Crucially, I ensured there was a public consultation survey measuring contact through police buildings. It found that 91% of participants had not used a public help desk in the last 12 months, with 61% having never used one at all. “Given the extensive options now available to contact the police, such as ‘live chat’, online reporting and crime tracking on top of the 101 and 999 telephone numbers there has been a real shift away from physical attendance at stations and premises. “I have also invested £20million to transform the way the police now work, including the introduction of agile equipment and mobile device. This allows officers to spend more time away from stations and on the streets and in our communities which is where people across West Yorkshire tell me they want to see them. “It was aside this backdrop that we are able to make informed decisions about our estate, reflecting the actual needs of the public. “What is important to recognise, however, is that the loss of a building, does not equate to the loss of police presence or a change in response times. “We have been careful to ensure that there is an enduring Neighbourhood Policing footprint across the county and that every opportunity for contact is exploited. “Partnership working, including with our emergency services partners, and co-location continues to play a key role, sharing premises where possible to provide a greater visibility across our communities. “The decision to sell underused and costly buildings to run, has now placed West Yorkshire Police in a better position for the future in keeping more people employed.